I have many happy memories of playing board games with my family–Battleship with my brother, The Game Of Life with my parents, and Trivial Pursuit with everyone else. When I was young, board games were one of the funnest ways for a group of people to pass the time. But with the advent of the Internet, access to thousands of movies and TV shows, and ever-advancing video games, most people have forgotten about board games. A few years ago I visited my brother and he showed me some of his favorites: Last Night On Earth, Pandemic, and Settlers of Catan. I was blown away. For me, the term “board game” had always brought to mind Clue, Monopoly, Scrabble, and all the other classics. I had no idea there were so many new board games with such interesting premises. Maybe you’re just like I was. If so, you’re missing out. There is a whole world of awesome board games that most people have never even heard of. 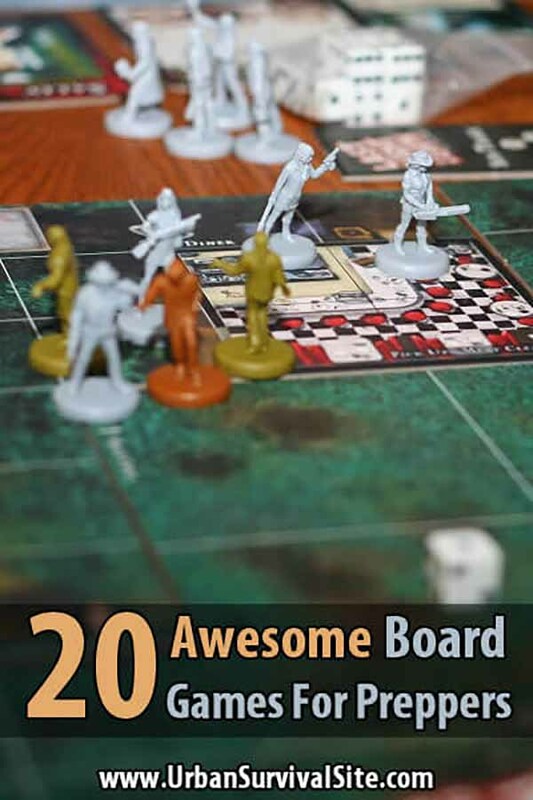 I couldn’t possibly share all the best ones in a single post, so I’m going to focus on board games that preppers might be interested in–games involving war, zombies, and/or the end of the world. Most of them aren’t very educational, but they sure are fun. 1. Axis and Allies 1941 – The best WWII-themed board game ever! It’s set in 1941, and the Axis is expanding its reach across Europe and Asia. Play as either the Axis or Allied powers, command your country’s military, and manage your country’s economy. In order to win the war, you’ll have to plan your attacks, resolve conflicts, and take control of the world’s most important cities. This game is designed for 2-5 players and takes about 2 hours. 2. City of Horror – A horde of zombies is invading the city, and in order to survive you’ll have to forge alliances and sometimes betray your companions. Control several characters at once–each with his or her own abilities–and have them barricade locations, scavenge for supplies, get the zombie vaccine, and reach the helicopter before it’s too late. This game is for 3-6 players and takes about 90 minutes. 3. Dead of Winter: A Crossroads Game – You’re in charge of a small group of survivors in a world where almost everyone is either dead or undead. To win the game, you must work with other players toward a common objective. However, you must also achieve your secret objective. Unlike most zombie board games, Dead of Winter is a psychological survival game where you deal with the other players more than the zombies. Sometimes everyone wins, sometimes only a few win, and sometimes no one wins. This game is for 2-5 players and takes about 100 minutes. 4. Dead Panic – The zombie apocalypse is here, and a group of survivors are trapped in a remote cabin. Take the role of one of eight characters–each with unique abilities–and fight the zombies that are closing in from all around. If you can last until survivors bring the pieces you need to build a radio, you’ll be able to call for rescue. But if you die, you’ll come back as a zombie with a whole new set of rules! This is a fun game for 2-6 players and takes about 90 minutes. 5. Doom and Bloom SURVIVAL! – A pandemic has wiped out 99% of the population, and you have to gather food, weapons, medical kits, and other supplies in order to survive. Plan your routes carefully to include areas that have supplies, and fight off raiders while you’re at it. You can use your supplies, but don’t use too many because you need a certain amount to win the game. If you are the first one to reach safe haven with all the required supplies, you win. This game is for 2-4 players and takes about 45 minutes. 6. Last Night On Earth – In this game, one set of players controls the heroes while one or two other players control the zombies. Combat is resolved by rolling a dice and using weapon cards. The creators went to a lot of effort to make it feel like you’re playing out a horror movie, including movie tropes, photographic art, and even a CD soundtrack. There are eight heroes to choose from, multiple scenarios, and even a modular game board, making it very replayable. This game is for 2-6 players and takes about 90 minutes. If you like this game, check out the expansion packs. 7. Let’s Go Hiking – In this game you don’t play against each other, you play together. Your group travels into the woods with nothing but binoculars, cameras, and some other equipment. The goal is to track animals and get as many photographs of them as possible. It’s not easy, though. If you’re not camouflaged or if you’re too loud, animals will run away before you can get a photo. Players can also get hurt and require first aid. This game will teach you all about the woods and the plants and creatures that live there. It’s for 2-6 players and takes about 30 minutes. 8. Oh No… Zombies! – You’re trapped in a shack surrounded by zombies in the middle of nowhere. Your cell phone doesn’t work and the land lines are busy. Your only chance is to get to a store where you can find a battery for the radio and a gun for self defense. If a zombie bites you, you’ll turn into one of them and go after the other players. Because the rules are so simple, this game is ideal for children and people new to board games. It’s for 2-4 players and only takes about 30 minutes. 9. Outdoor Survival – This is another cooperative game where you play together instead of against each other. You and your group are lost in the middle of the wilderness. To survive, you’ll have to find food and water, avoid dangerous animals, and stay healthy. This game is a great introduction to outdoor survival techniques for children and new preppers. It works with 1-4 players and takes about 30 minutes. 10. Pandemic – You are part of a team of specialists whose mission is to stop the spread of four diseases that have broken out around the world. You’ll need to travel between cities, build research stations, develop cures, and treat infected populaces. But you’ll have to work fast because the diseases are spreading and time is running out. In this game, everyone wins or everyone loses. It’s for 2-4 players and takes about 45 minutes. 11. Settlers of Catan – Your mission is to settle the mythical island known as Catan. To do so, you’ll need to gather resources (brick, grain, lumber, wool, and ore) and build roads and cities. You can trade with other players, but you also have to watch out for robbers. This is one of the most popular strategy board games ever made, not only because it’s fun, but also because the modular nature of the board makes it very replayable. It takes 3-6 players and lasts up to 90 minutes. 12. Survive: Escape From Atlantis – Atlantis is sinking into the ocean and your explorers have to escape to the surrounding islands before it’s too late. The characters can use boats or they can swim, but they’ll have to watch out for sea serpents and sharks along the way. You can make alliances with other players, but beware of traitors. The goal is to get as many of your people to safety as possible before the volcano explodes. This is a really fun game for 2-4 players. It takes about 60 minutes. 13. The Walking Dead – Take on the role of Rick, Shane, Andrea and other characters from the The Walking Dead as you battle your way through walker-infested Atlanta. You’ll have to gather supplies, search for weapons, and make allies if you want to reach your destination. But be careful because when supplies are low it’s every man for himself. And if someone dies, they’ll turn into another walker. This game works with 1-4 players and takes up to 45 minutes. 14. Tomorrow – This game is set in a future where the world is overpopulated and resources are dwindling fast. The only way to save the human race is global de-population. You represent one of six major world powers who are all negotiating to get the best deal for their own people. There is very little luck involved here. Rather, you must match wits with your opponents if you want to win. This controverisal game is simultaneously fun and disturbing. It is designed for 4-6 players and takes about 90 minutes. 15. Wildcraft! An Herbal Adventure Game – Your grandmother needs huckleberries for a pie, so you and your friends travel up a mountain in search of berries and other herbs. Along the way, you’ll have to identify real wild edibles and medicinal herbs, learn what to use them for, and make it home before nightfall. This game is both educational and fun for people of all ages. It is designed for 1-4 players and takes about 90 minutes to play. 16. Wilderness: A Game Of Survival – You and the other players are stranded in the wilderness, and the goal is to be the first one to the nearest village. On the way there you’ll have to search for food and water, watch out for predators, and stay healthy. The hungrier and thirstier you are, the less energy you’ll have when it’s your turn. You even have to find time to sleep. Each day has its own set of rules and each landscape has its own challenges. This game is for 2-8 players and lasts about 2 hours. 17. Zombicide – The ultimate board game for people who love to kill zombies. The more zombies you kill, the more you improve your skills. And the more you improve your skills, the more zombies there are. Work with other players to make the best use of limited ammunition. The game includes ten different scenarios on ten different maps, but you can download new scenarios from the official website. It’s for 1-6 players and lasts about 60 minutes. 18. Zombie 15′ – The number 15 is key in this game about a world where all the adults have turned into flesh-eating zombies. The rules are simple, but you’ll have to make quick decsions as each game only lasts 15 minutes (it even comes with a 15-minute soundtrack to accompany the game). Work with others, find food and shelter, meet other survivors, and discover the truth about the zombie virus. Although this game only takes 15 minutes, it’s worth playing several times in a row. It’s designed for 2-4 players. 19. Zombie Survival – This game has two parts. In the first part, you select items to place in your house–first aid supplies, fuel, lumber, weapons, and so forth. Make the right preparations because in the second part, a hoard of zombies is heading toward your home. Will you leave your family to face the zombies alone as you head to town for more supplies? What if the power goes out or the water is contaminated? Can you keep your family alive and healthy? This game is for 1-4 players and takes about 90 minutes. If you like it, check out the sequel game, Zombie Survival 2. 20. Zpocalypse – The zombie apocalypse has arrived. You and the other players start in a fallout shelter and make your way to several base locations. Along the way you’ll have to gather food, water, guns, ammo, and other supplies if you want to survive the next zombie attack. Each player controls a squad and earns points for killing zombies, fortifying bases, and accomplishing specific goals. Whoever has the most points at the end wins. This game is for 2-4 players and takes about 100 minutes to play. If you know of any other great board games for preppers, please leave a comment and let me know. I may expand this list in the future. Have fun! If you wanna play a great game, go get The G.O.O.D. Game. It stands for Get Out Of Dodge. It is a post apocalyptic game that starts you out is the Big Nasty city and u must work you way out, gathering supplies, using every survival skill you have and just hoping to get lucky enough to make it out alive. The G.O.O.D. Game all the way!!! I agree with Doyle The G.O.O.D. Game should be on there. It’s super fun and pretty new that’s probably why it didn’t make the list. If your looking for some prepper fun it should be a game you have. I believe it is by killswitchbunkergames, a little prepper game operation out of Missouri. Teach them with The G.O.O.D. Game, incase they ever need to get out of dodge. Its intended for 13 and up and is a post economic collapse game. All look good… but: so expensive! Fun for the rich prepper.